Peace talks between North and South Korea have continued partially due to the massive support from civil society and grassroots activists. 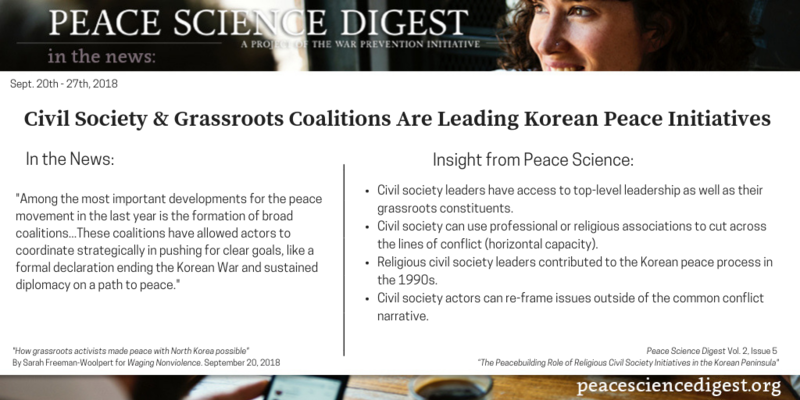 Peace research has shown the influence civil society has on both social and political issues-the more people come together in support of peace on the Korean Peninsula, the harder it becomes for world leaders to disagree. Religious civil society leaders contributed to the Korean peace process in the 1990s. In international conflicts, the focus is usually on “Track One” diplomacy, the official negotiations between high government officials or military leaders. By examining who civil society actors are, we can broaden our understanding of diplomacy to include those efforts that take place at multiple levels and thereby address the conflict more comprehensively. The so-called “multi-track diplomacy” framework includes official and unofficial conflict resolution efforts, citizen and scientific exchanges, international business negotiations, international cultural and athletic activities, and other international contacts and cooperative efforts. The nine specific tracks, which produce a synergy in peacebuilding, are public opinion and communication; government; professional conflict resolution; business; private citizens; activism; religion; funding; and research, training, and education. We need to identify and encourage civil society organizations that have the capacity to build vertical and horizontal relationships for sustainable peacebuilding. This study has shown how religious actors used their beliefs about how we should behave toward each other in the context of Korean peace and unification efforts. As the author notes, this is an already existing opening for the present-day situation. When considering the multi-track diplomacy framework, we can identify civil society organizations like Rotary International, whose commitment to peace, goodwill, and understanding is in their institutional DNA. Many Rotarians worldwide are dedicated to peace and have the capacity for horizontal and vertical engagement as discussed in this research. Civil society service organizations like Rotary International and its individual members can cooperate with professional peacebuilding organizations, such as the ones found in the Alliance for Peacebuilding, to achieve synergy. Lastly, civil society expert Thania Paffenholz outlines some functions for civil society actors in peacebuilding. These are protection; monitoring; advocacy and public communication; in-group socialization; social cohesion; intermediation and facilitation; and service delivery.